A week ago, we showed you a teaser released by Asus that showed three different versions of the Asus Zenfone 3. Expected to be in stores next month are the the Asus Zenfone 3, Asus Zenfone 3 Deluxe and the Asus Zenfone Max. The latter is the premium version of the device with the Zenfone 3 Deluxe taking the role of the low-priced version of the range. The Zenfone 3's specs were revealed last week in a AnTuTu benchmark test. Today, a GFXBench benchmark test gives us another look at what we can expect to see from the Zenfone 3. The latest benchmark test confirms both the 5.5-inch screen on the handset (which works out to about 13.8cm as seen on the test) and the Snapdragon 820 SoC under the hood. The chipset features a quad-core 2.1GHz CPU and the Adreno 530 GPU. Both benchmark tests show 4GB of RAM inside. While the AnTuTU test was run on a model with 32GB of internal storage, the unit that appeared on GFXBench flashed 128GB of native memory. 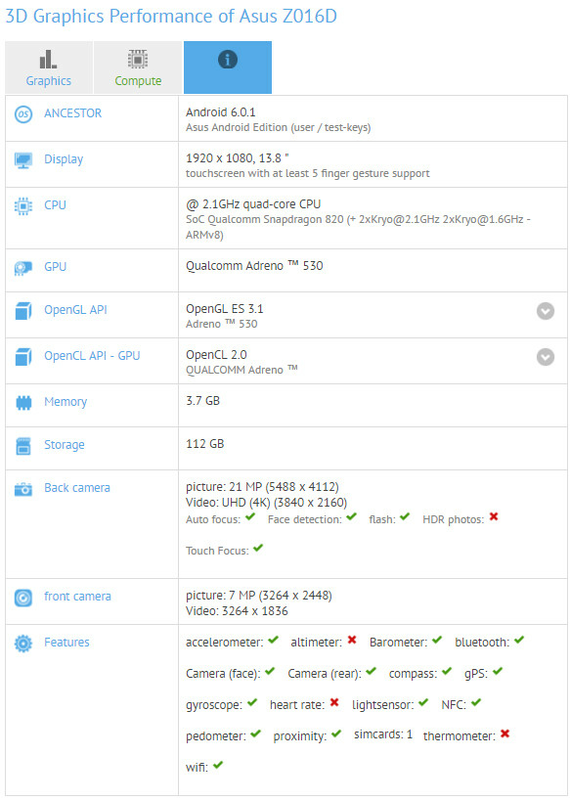 The rear camera was listed at 23MP on AnTuTu and 21 on GFXBench, although the latter could still end up being 23MP. An 8MP front-facing shooter will handle selfies and video chats. The Asus Zenfone 3 and the two other variants will be unveiled in Taipei on May 30th at Computex 2016.
yaeh if this has the same pricing as last year it will be a sold out. Yep. Those are killer specs. At $300 it will be a huge hit. They will not likely. Check the update to Marshmallow for Zenfone 2 Laser. They like kicked out three quarters of apps they installed before on Lollipop. i havn't checked it yaar....but, my mom has zenfone 5 & it has lot of apps (mostly of asus only). google (or oem's) should give us the choices to uninstall any app we want from android devices !! & if we need them again, we can get them on play store or app store of specific oem (like galaxy apps). it will save lot of space, which can be used as we want. My dad also have Asus. Zenfone 2. Asus bloatware make Samsung phone looks like perfect phone. agreed !! & samsung has a bad reputation for bloatware !! They should use asus phones once !! I hope Zenfone 3 have a 6"+ varian. 128gb version for 400USD will be great. Lenovo Zuk z2 pro is a great phone in this category. Good. Now people might buy this one compared to the S7.